The problem with most football statistics that are displayed in the media is that they can be too heavily skewed, they normally don’t allow you to make a fair comparison between players. FutMexNation’s Tom Harrison been attempting to correct this in recent months, by using the fantastic set of data provided by sofascore to create more effective stats, and support from the team at Soccer Nurds. First, the aim was to remove the influence that game time has on statistics, as, for example, comparing number of dribbles when two players have been on the pitch for differing amounts of time would be unfair and could lead to an incorrect judgement. Therefore, per 90-minute data was calculated, and used to analyse performance. However, this data could still be greatly skewed, depending on how often each player receives possession in 90 minutes. A player for a side who average high possession figures, such as Tigres, is likely to receive possession more often per match than a player for a side that average low possession figures, like Monterrey. 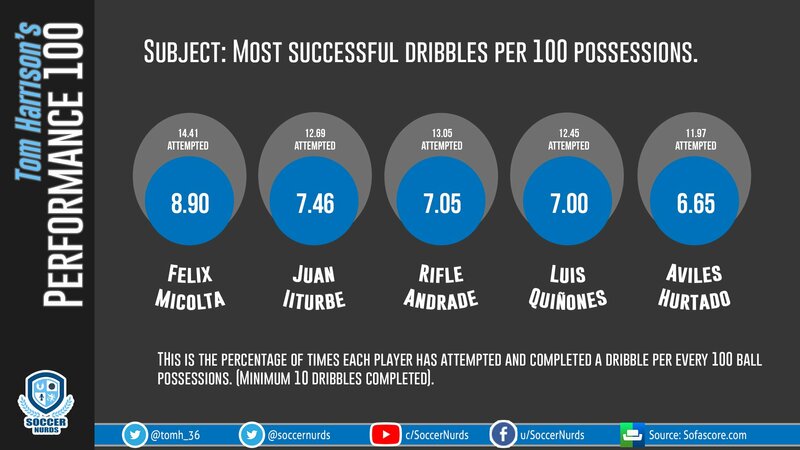 Per 90-minute data doesn’t take into account how often a player receives the ball and therefore has the opportunity to, for example, complete a dribble. The solution was to use possessions as the control figure, rather than minutes played. 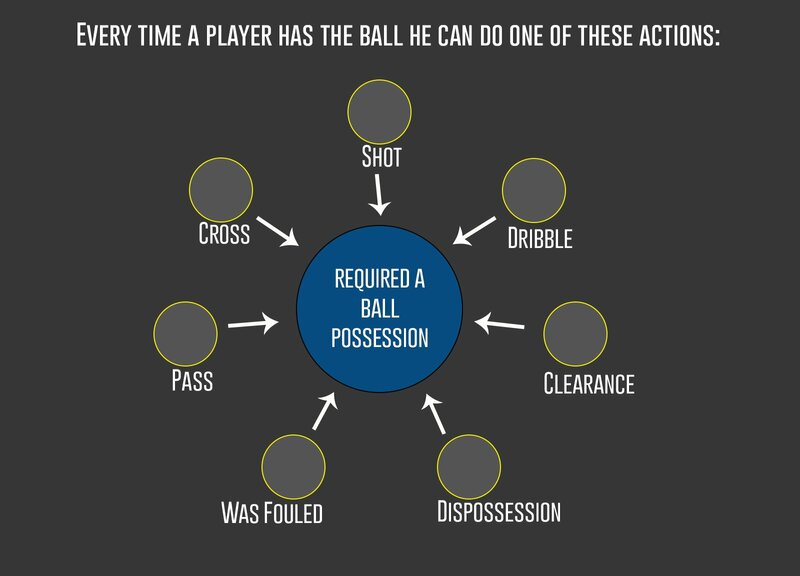 Per possession data, which looks at what each player (or team) does per 100 times that the ball is possessed, can be used to understand each player’s (or team’s) style and their efficiency in different aspects of the game. It’s important to remember that this data is not completely perfect, as the position on the pitch where players receive possession can differ (although the impact of this is reduced if only players in similar positions are compared), but it is a significant improvement on how statistics were previously presented. 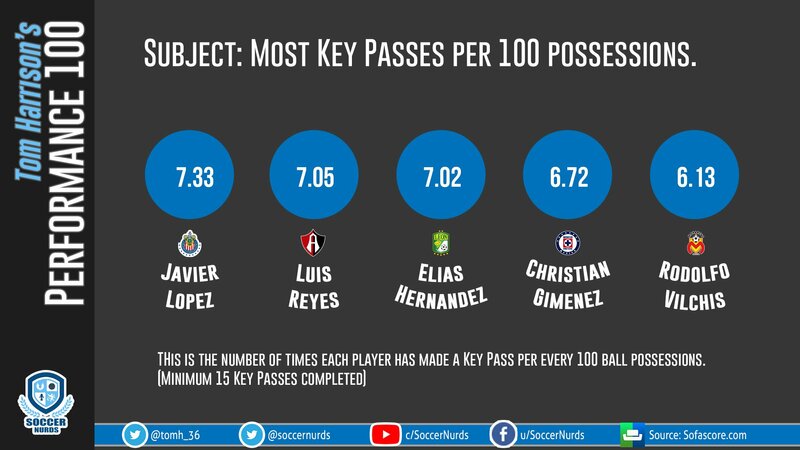 To better explain this new method of creating, presenting and understanding data in football, the Liga MX top fives in certain aspects of the game are presented below. All data is taken from the 2017 Apertura. The first focus is on key passes. Simply described, passes that lead to a shot. The graphic displays the five players with the highest number of key passes per 100 possessions across the season. 15 key passes must have been made to qualify for the top five. Javier “Chofis” López tops the list, which puts some doubt into the belief of many that Chofis is a highly inconsistent attacking player. Luis Reyes’ position in second is extremely impressive considering he’s a full-back, whilst Elías Hernández, a strong contender for player of the season, sits third. The top five is rounded off by Rodolfo Vilchis, who’s impressed for Morelia over the last year or so, and deserves more attention. 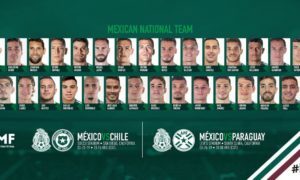 All of the top five are Mexican, but interestingly none of the five made the latest El Tri squad. Successful crosses are crosses which find a teammate. With many successful crosses leading to shots, there’s a large crossover between this stat and the key pass stat. Therefore, it’s no surprise to see Elías Hernández and Luis Reyes qualifying for both top fives. 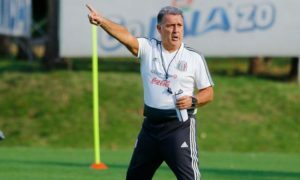 Third place will be a surprise to many, Querétaro’s Erbín Trejo. Similarly to Vilchis, Trejo spent many years on the side-lines, but has really impressed since receiving some first-team opportunities. Another talented Mexican makes the list, Gael Sandoval. 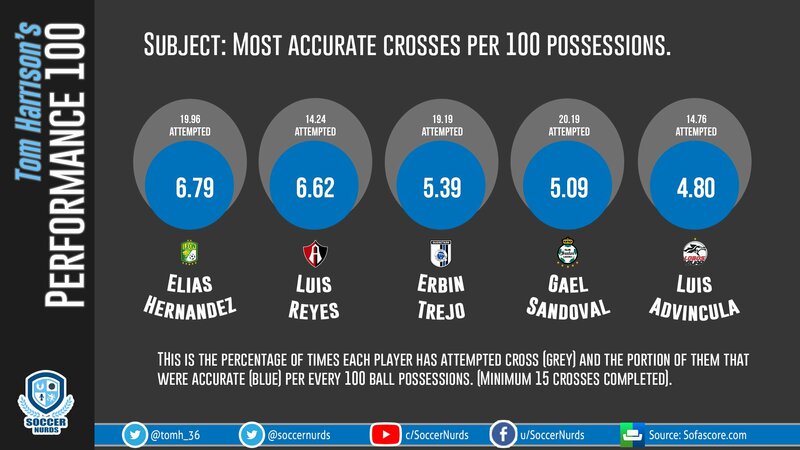 It’s important to note that the young Santos midfielder has attempted more crosses per 100 possessions than any other player in the top five, but his cross completion rate (around 25%) isn’t too poor. Here’s the top five for completed dribbles per 100 possessions. As with the crossing data, dribble attempts are also displayed in order to give an indication of dribble success rate. 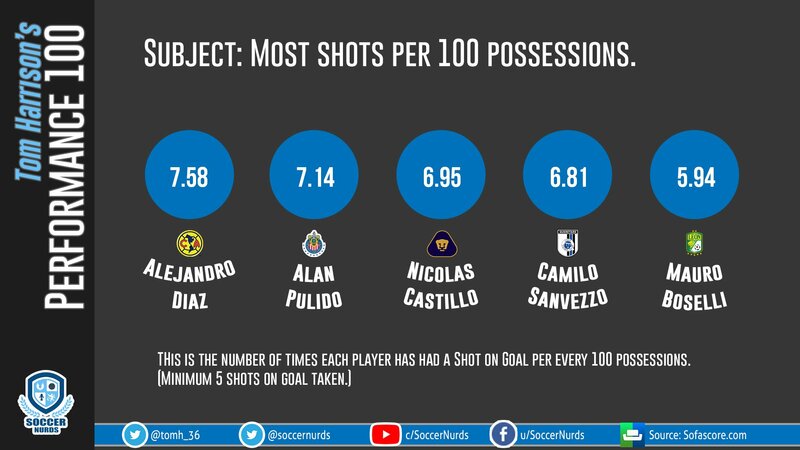 Puebla’s Félix Micolta, a powerful and tricky runner, tops the list, followed by some of Liga MX’s usual suspects. Luis Quinones has been a controversial figure at Lobos, but his position here underlines the talent that he has. Could be a quality pick-up over the winter break if Tigres don’t want him. A surprise figure leads the shots per 100 possessions list, which gives an excellent idea of who the most direct forwards in Liga MX are. Perhaps impacted by his usual role as a substitute, Alejandro Díaz tops the list, followed by some of Liga MX’s top strikers. Another surprise about this top five is the lack of Dorlan Pabón. Known as one of the most shot-happy players in Mexico, Turco Mohamed has perhaps managed to cut down on Pabón’s shooting this campaign. Finally, probably the most interesting top five. Goals and assists have been added, with each player’s goals and assists per 100 possessions calculated. Camilo Sanvezzo tops the chart, getting a goal or an assist over 4% of the time that he has possession. Extremely impressive considering the Brazilian’s previous injury problems, and suggests that Jimmy Lozano was wrong to rotate Camilo with other forwards Emanuel “Tito” Villa and Everaldo. League top-scorer Mauro Boselli unsurprisingly sits second, but third place is a major shock. 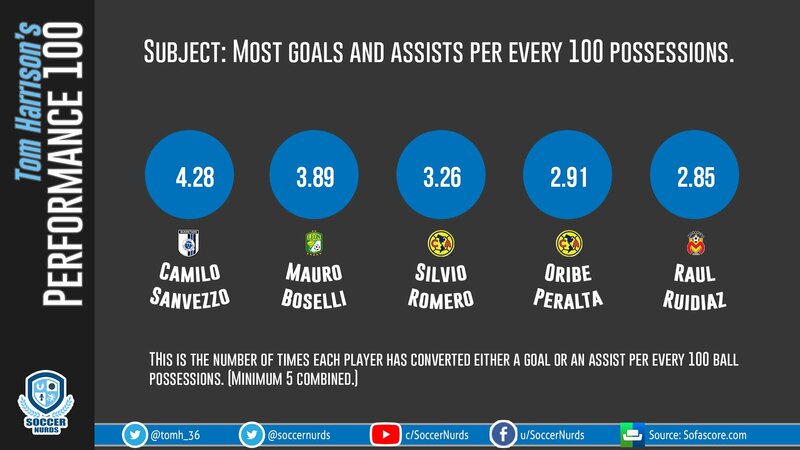 As with last season, when he had the best shots-to-goals efficiency in the division, Silvio Romero’s statistics far out-weigh how his performances come across to the eye. It’s important to remember that these stats can be skewed by luck, e.g. a deflected goal, but his high ranking in such a crucial top five cannot simply be dismissed. 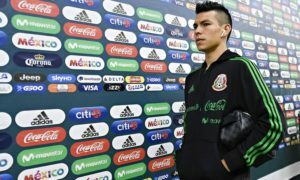 Romero’s striker partner Oribe Peralta sits in fourth, showing how efficient América, whose overall statistics don’t stack up too well against other Liga MX title candidates, have been at turning possession in the final third into goals. These top fives are just the beginning of ‘Performance 100’ data being used by myself, Tom Harrison, and Soccer Nurds. We hope that this revolutionary method of looking at data within football will help improve knowledge and understanding of the beautiful game, in Mexico and beyond. 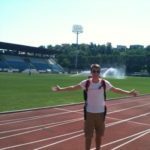 If you have any questions or requests for data, don’t hesitate to get in touch on twitter, @tomh_36.